My kids are alike me in so many ways. Some good and some bad but I like to focus on the good. One thing that the three of us love are our daily smoothies. None of us are morning people so smoothies have to be a mid-day snack instead. My kids are always eager to try my latest concoctions, and I’m more than pleased to see my ridiculously finicky 2-year-old happily drinking a nutritious snack. We go to eating therapy once a week and I tell ya, some days the most nutrients he gets are from those smoothies! Smoothies are a sweet and delicious treat that’s great for kids of all ages! Instead of ice cream or candy, smoothies are our go to treat around here. Sometimes something more indulgent is needed like frozen yogurt with five different toppings but most days, a smoothie hits the sweet spot! Especially when your smoothie is chock-full of strawberries and lemons!! Strawberry lemonade is the go-to drink of summer, right? Who says it can’t be enjoyed all year long? Who says you can’t throw in some cashews and dates to kick the flavor and nutrition up a notch? That’s what I do in my family’s favorite Strawberry Lemonade Recipe and I hope you’ll give it a try! Who needs candy when you can have smoothies? If you think you have to add sugar to your kid’s smoothies, you don’t. I promise! This strawberry lemonade smoothie is sweet, a tiny bit tart, delicious and best of all—actually good for you and your kids! I’ll admit that while I developed this smoothie recipe with my kids in mind, it’s one of my favorites as well. I love how refreshing it is. It’s a nice treat to break up a hectic day. I hope you’ll try serving up this truly yummy Strawberry Lemonade Smoothie this year for Valentine’s Day and ditching the candy. You and your sweethearts will love it! – Blend on high speed until smooth. Serve immediately. If you’re in the need for a heavy duty blender to help create yummy smoothies of your own look no further than the selection at Wayfair. They’ve got every brand and the reviews are so helpful in finding the perfect one for you. These old fashioned chocolate donuts are incredibly delicious and super filled with the chocolate flavors we all know and love. This post contains affiliate links. Friends, I found the recipe that I want to make for the rest of my life. Like seriously there’s nothing better than these old fashioned chocolate donuts! And it’s not because I made them and I’m incredibly proud of them, which I am because excuse me homemade donuts made from scratch in my own kitchen, if that’s not impressive then I don’t know what it is. But it’s because the fact that they are so good they taste even better tan the store-bought ones. Yes, these ones taste way better than the doughnuts you could purchase at an upscale coffee shop and way better than the ones they sell at farmers markets. If homemade donuts that taste better than anything doesn’t convince you to make them then I seriously don’t know what can. The other great thing is that this recipe is also incredibly easy to make. You don’t need a ton of things or crazy skills to be able to whip them up in your kitchen, which in my opinion, is the best thing ever. Because you know what’s super annoying? Finding a recipe that everyone claims is the best thing ever and realizing you need to be a pro at cooking to be able to actually make it. But back to these old fashioned chocolate cake donuts. They are moist without being too wet, they are soft without being mushy, and they take so little time to make them that it still amazes me. My only advice is to make a batch big enough so everyone can have seconds, because while they are super filling, they are so delicious that everyone is going to reach for seconds. – In a bowl mix the flour, cocoa powder, baking powder, salt, and nutmeg. – In another bowl combine the buttermilk, chocolate milk, eggs, butter, and vanilla. – Pour the wet ingredients into the bowl with the dry ingredients. – Stir well until the batter thickens. – Pour the batter into a greased donut pan. – Place in the oven and bake for 15 minutes or until well done. – When time is up, remove the pan from the oven. – Let to cool and gently remove the donuts from the pan using a rubber spatula. This Caramel Pumpkin Trifle brings delicious fall flavors together in an easy and elegant dessert! It’s like eating fall in a cup. This is a great dessert to make in individual servings or in a big trifle dish for the holidays. Thanksgiving is right around the corner you know! This yummy parfait is made with Marie Callender’s pumpkin pie, caramel sauce, graham crackers, and Ready Wip. My favorite thing about this recipe is how easy it is. My kids helped me make it and they loved making it as much as eating it. Directions: Gather your ingredients and add a heaping tablespoon of crushed graham crackers to the dish. Add a layer of pumpkin pie. Add a layer of Ready Wip. Add a layer of crushed graham crackers. Add a layer of pumpkin pie. Add a layer of Ready Wip. Drizzle caramel layer on top of your dessert for a lovely presentation. We had some leftover pumpkin pie and made these little pumpkin hearts with cookie cutters. We added a little Ready Wip on top and sprinkled with cinnamon and they were ready to serve! These mini pumpkin pies are yummy with hot chocolate. We add a squirt of Ready Wip and a sprinkle of cinnamon to our Swiss Miss hot chocolate to make it extra special! I’m not one for making pies, Marie Callender makes all of mine for me. I figure that make in another stage of life I’ll learn how and make the perfect pies. For me, stopping by Walmart is a fool-proof way to get a delicious pie and I can spend more of my time with those who mean the most to me. Easy peasy. 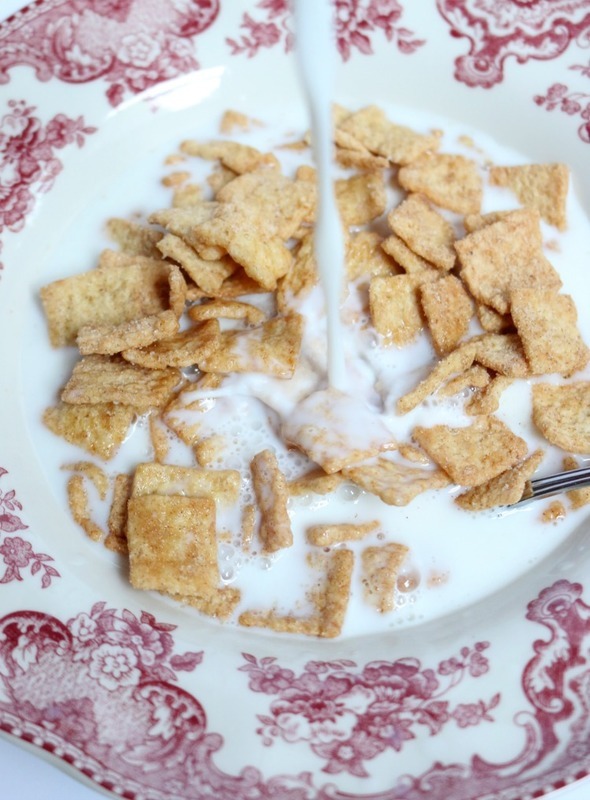 Do your kids eat cereal like it’s going out of style? Or maybe you have a husband that does? I know quite a few men who’ve been known to eat cereal out of larger kitchen bowls than a regular cereal bowl. I don’t know about you but we go through a lot of cereal in our house! It’s a permanent item on our store list just like milk and bread. Every time we go to the store we pick up a box or two. Recently, I was encouraged to branch out of my regular boxed cereal and try bagged cereal. I’ve never had anything against bagged cereal but I didn’t know how it would stay fresh without buying a plastic container to store it in. I sure don’t need another thing to store in my kitchen! However, these awesome bags I tried from Malt-O-Meal® have a small zip pouch built in. I love that about it! Not only are Malt-O-Meal bagged cereals larger but they’re also more affordable. The large bags are a better value than similarly boxed cereals. Win-win! 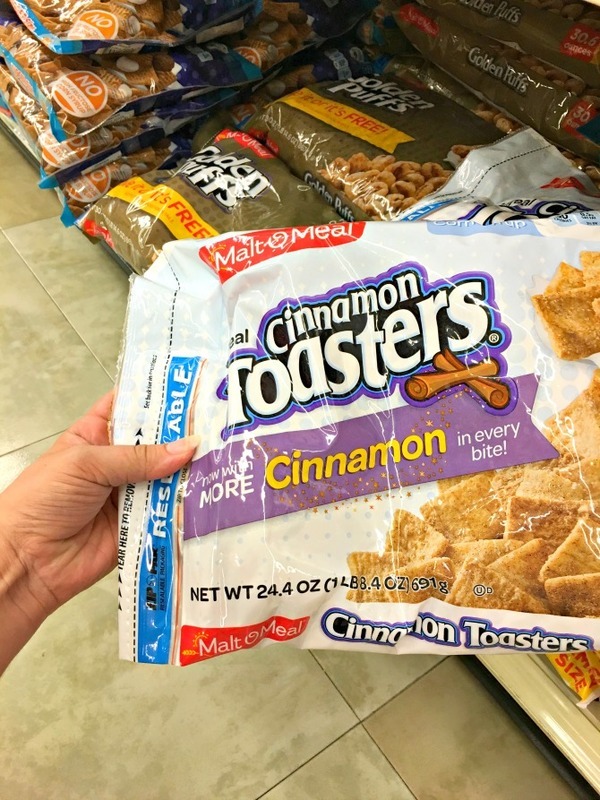 Moms who say, “We don’t buy that cereal because you’ll eat it all” can now buy the cereal their kids love because they can buy it in bulk and save money doing so! Malt-O-Meal bagged cereal comes in a slew of varieties too. They have 34 flavors (some listed below). They have something that every member of the family will love. 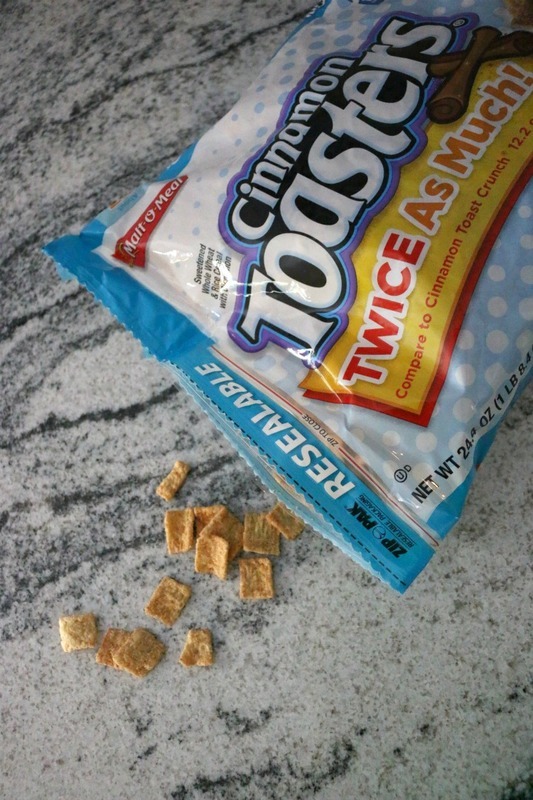 Cinnamon Toasters is the first Malt-O-Meal bagged cereal that I’ve tried but I loved it and look forward to trying S’Mores and Golden Puffs. I loved how good it was dry! This will be a great little sweet snack for my daughter to take to school in her lunch. Right now at Food Lion, when you buy delicious cereal you’ll get coupons to save even more on your next cereal purchase. 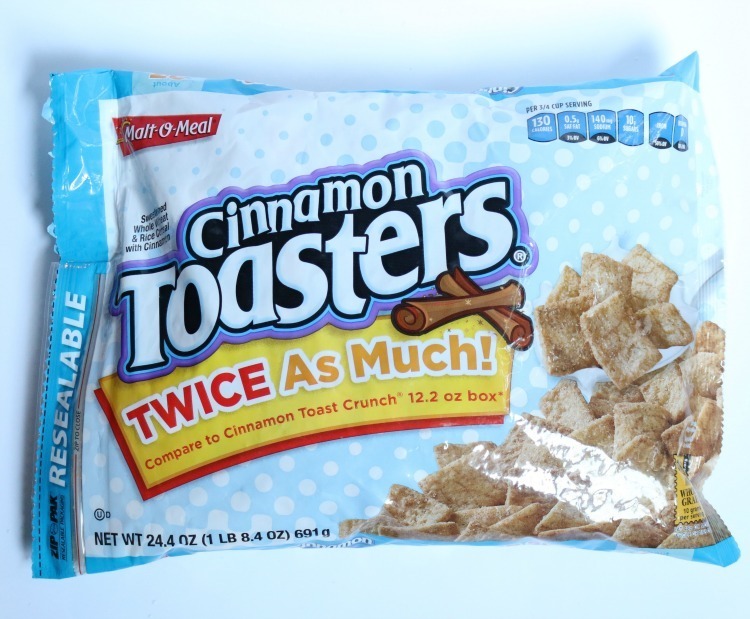 – Buy 1 MOM Brand Cereal get a $1 off 2 MOM Brand cereals on your next shopping purchase. – Buy 2 MOM Brand Cereal get a $1.5 off 3 MOM Brand cereals on your next shopping purchase. – Buy 3 MOM Brand Cereal get a $2 off 4 MOM Brand cereals on your next shopping purchase. 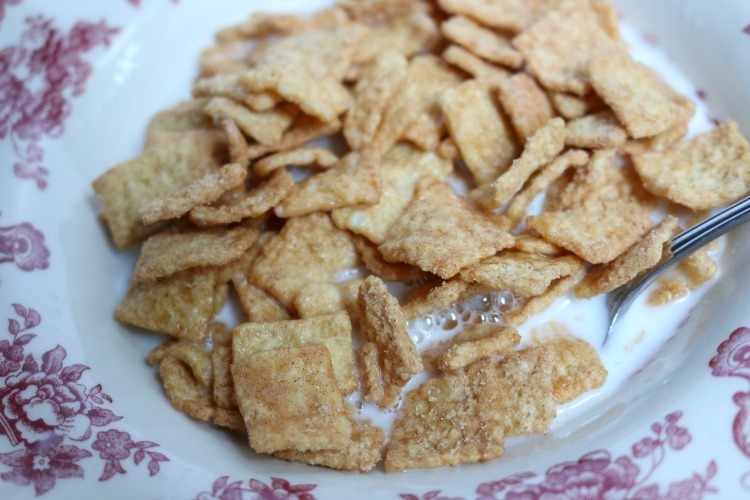 – Buy 4+ MOM Brand Cereal get a $2.5 off 5+ MOM Brand cereals on your next shopping purchase. Did you know that not only does cereal make a tasty meal but it’s also great to serve as a dry snack for the kids and can be used in recipes. Check out this delicious coffee cake recipe. Bake for 40 to 50 minutes or until toothpick inserted in center comes out clean. Cool. Enjoy! Go here to find more Malt-O-Meal recipes. Every once in a while I find myself craving something with chocolate and mint. You know the super refreshing flavor combo that a lot of popular ice creams and cookies have. And every time I find myself with those cravings I whip up a batch of Mint Cake Squares. Mint Cake Squares are one of the easiest desserts ever. You don’t need decorating skills, you don’t need to spend a lot of time mixing and prepping, and the ingredients are mostly things that you probably already have. They are also a total crowd favorite, seriously friend! You’ll want to make a double batch of this just to make sure you have enough Mint Cake Squares for everyone and then enough leftovers. I seriously haven’t found the first person that doesn’t like them and every single person that tries them asks for the recipe. So you can be sure that this is a tried and true hit. For me the secret is adding the mint only in the frosting, so you get the super chocolaty, super fudgy cake base, and then you get the cool and refreshing mint frosting. A couple of times I have added the mint extract in the cake as well but the result is not nearly as good so even if you are a mint aficionado, don’t go that route. And then after yo have your cake done and frosted, top it off with some crunchy chocolate shavings, not only they are super cute and really help to decorate the cake (and cover any decorating mistakes) but they also provide another layer of flavor, which is pretty awesome as well. You can serve it by itself, with a big scoop of vanilla ice cream (the bigger, the better) or even with some whipped cream and a couple of berries. – Preheat oven to 350°F. Grease and flour a cake pan. Set aside. – In a bowl, pour the melted chocolate, add the sugar, butter, and eggs and beat until incorporated (around 3 minutes). – Continue whisking while adding flour, vanilla extract, pecans, cocoa powder, and baking powder. – Pour the batter into the prepared cake pan and take to the oven. bake for 35 minutes or until done. – Remove from the oven, and let it cool until it’s no longer hot to the touch. – In a bowl, place the frosting and mix with the mint extract and the green food coloring. – Frost the cake and top with chocolate shavings. – Cut into squares, serve and enjoy. Muffins are delicious and I seriously consider them one of my favorite breakfast options. From time to time, I find myself making them for dessert and grabbing one or two as a snack. These cinnamon sugar pumpkin muffins are my favorite muffins, and that comes from a gal that has made a ton of different muffins over the years. This is one of those incredibly good and mouthwatering recipes. It’s also really easy to make and it’s perfect for this season! I like to make them with store bought pumpkin puree but I once made them with pumpkin puree made from scratch and the result was just as good! What I love the most about this recipe is how incredibly easy it is to whip up. There aren’t a lot of complicated steps or difficult ingredients. Just the tried and true ones you probably already have in your pantry. The only thing that’s a bit out of the ordinary is the oat flour but you can make it yourself grinding oats in your food processor until fine. It takes around 40 seconds top and it makes the Cinnamon Sugar Pumpkin Muffins even more filling which makes them an incredibly good option for breakfast. And then there’s the topping. Oh my, the topping that coats the muffins tastes delicious. It’s sweet, it’s a bit crunchy, and it’s a total crowd pleaser. I just mix some milk, powdered sugar, and a pinch of vanilla extract and then is just a matter of filling a piping bag and decorating. I sometimes skip the topping to keep the muffins healthier or if I’m a real hurry because they are delicious by themselves, but the topping really makes this a total crowd favorite recipe. It’s one of those recipes that people ask me for after they try them. – In a bowl, mix the mashed pumpkin with the sugar, milk, vanilla, butter, egg, and ground cinnamon. – Add the all-purpose flour, oatmeal flour, and baking powder into the bowl. Stir repeatedly until the batter has no lumps left. – Set a cupcake tray with paper cupcake liners and fill them. – Bake for 20 minutes or until done. – For the glaze, mix milk, sugar, and vanilla extract until getting a thick mixture. – Remove the tray from the oven and let them cool down. – Drizzle the muffins with the glaze. Summer is in full swing, and I’m craving all the summery treats, s’mores and ice creams are all I can think of so I went into full cooking mode and made one of the most delicious ice creams ever s’more ice cream! 1. Use chilled ingredients: This is one of the most important things, start with cold ingredients and then mix them together. If the ingredients are cold, the freezing part goes so much faster. 2. Pick your method: You can use an ice cream maker (this is our ice cream maker and we LOVE it! It’s so much quieter and nicer than the vintage ice cream maker I grew up with) or use a manual method. All the options work great, and while the ice cream textures vary a little from one to the other, they are all delicious. And that’s pretty much all the technical things that you need to know to make S’mores Ice Cream at home. Pretty easy right? While you can make your base a chocolate one I decided to keep things on the vanilla side. I added marshmallow creme and graham crackers, and the result is pretty amazing. I usually don’t like adding chocolate chunks to my ice cream because they end up too hard when frozen, so I left the ice cream like this and then added a swirl of Nutella before serving. The S’mores ice cream is incredibly creamy and refreshing, and it’s a perfect icy treat for the hot summer afternoons, and since it’s so easy to make is a great recipe to make with the help of little ones. – In a bowl mix the heavy cream, half and half, sugar and vanilla extract. At the end of mixing carefully spoon in marshmallow crème and mix until combined. – Pour ice cream mix into ice cream maker and mix it according to instructions. – In the last few minutes mix in the Hershey’s bars and graham crackers. If you like this recipe, Pin it for later. Please tell me I’m not the only one with an insane peanut butter obsession. It’s one of those things everyone loves and you can cook in a million + 1 ways, and it’s (at least in my opinion) comfort food at it’s finest, seriously, I can’t think of one thing that I don’t like about peanut butter. So when I found myself with the need to make a cake for an impromptu party it was clear that it had to a be a peanut butter cake. And boy, what a good decision that was. First, it’s super moist, the type of melt in your mouth good cake that you just can’t stop eating. Second, it’s really packed with flavor, and third, the thick peanut butter layer on top that’s just pure happiness. Actually, the thick peanut butter layer on top makes this an incredibly easy to decorate cake since you don’t need a lot of tools or any technique, you don’t even need a proper peanut butter frosting because you are just using creamy peanut butter! It really can’t get any easier than that. While you can use any peanut butter you have on hand I actually advise using the store-bought creamy one. The chunky makes it a bit difficult to end up with a polished “frosted” cake while the natural or homemade ones tend to separate and end up looking oily (not pretty). If you still want that crunch factor just add some chopped peanuts on top. To make your cake pretty just open the peanut butter jar grab a spatula, cover your cake and that’s it. If you feel like going the extra mile you can serve the cake with some chocolate chips or banana silvers, or even with a scoop of ice cream. – Mix the flour, baking powder, sugar, and butter in a bowl. Then incorporate the eggs, milk and vanilla extract. Mix until you get a batter with no lumps left. – Pour the batter into a greased cake pan and take to the oven for 50 minutes or until done. – Remove the cake from the oven and let it cool down for 5-10 minutes. – Carefully remove the cake from the cake pan and let it cool for 20 minutes. – Decorate it with the peanut butter.